Really gorgeous! The handspun really looks great in that pattern. The baby surprise jacket is truly beautiful! also, you have great taste in movies! I don’t post about movie stuff on my blog because most of my knitting friends who read it are not movie-nerdy like me, but I LOVED GRINDHOUSE. :) I haven’t seen Little Dieter, but I do adore Herzog, so I really need to get that back on my netflix queue — Aguirre is one of my favorite films of all time. Happy knitting! That sweater is just so beautiful. And the handspun is gorgeous!! Wow. I LOVE how that yarn is knitting up. I want me some handspun! That is gorgeous! That handspun is beautiful. Oooh, the squishiness…. And I have got to go see Grindhosue. Love that sweater! I noticed the same thing with mine regarding the length of time it took to knit. I was surprised. The Baby Surprise Jacket looks absolutely wonderful, I really love the colors. I think that’s the prettiest Baby Surprise I’ve ever seen. I’ll admit I’m amazed by how nicely all the yarns are coming together. Wow! That is *the* best looking baby surprise I’ve ever seen. That’s the prettiest BSJ I’ve seen! Thanks for the movie recommendations – we usually look for the “squigglies” (critic’s laurels). See 300. It’s definitely a chicks movie :). The violence is for the guys, but the well oiled hunky men with six packs and wearing nothing but leather undies is for the ladies. ;) I’m not sure it’s a knitting movie though, you tend to forget what you’re doing when you watch it. I love the sweater though. 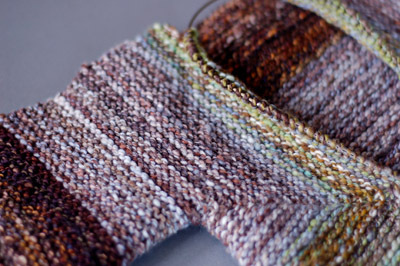 Hand spun is just beautiful when knitted up. LOVE that sweater, the colors are amazing and complement the pattern beautifully. jacket so special. I keep coming back to look at it, and procrastinating about casting on the Rowan All Season’s Cotton I chose for sweaters for July twins (pink and blue, how boring after seeing yours). Alas, googling for machine-washable worsted weight handspun was not helpful. Thanks for the movie recommendations. I’m off to Netflix. That sweater is turning out spectacular! I’ve got to buy the book just for that pattern. We just saw Grindhouse last week. Totally rocked! I am about to cry, that sweater is so beautiful! Will you make me one? I know what the answer is, and that’s okay :) There’s something about a long stretch of garter stitch that is very satisfying. To look at, I mean, if not necessarily to knit. Very very pretty. I really like the mellow greens. I never imagined that’s where the stripes would end up. Thanks for showing it folded up like that! Mmm, I love the sweater knit with your handspun. I finally finished mine! So fun. Now I’m working on the booties to match. Ha! Jenna and I saw Grindhouse together and we literally burst into applause and giggles at the end of it! Absolutely gorgeous! It looks dipped in gold. It’s looking fabulous in your handspun! The sweater is quite eye catching. The handspun is a perfect choice. I can’t wait to see the picture of the finished project. I love that you are posting shots of the not-finished product. 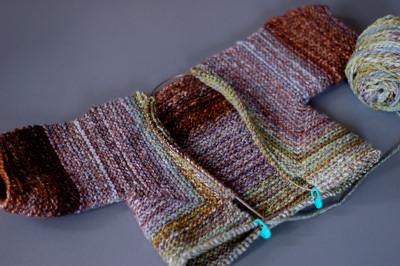 A friend is making this sweater in sock yarn and I was taking a turn at it for a bit without the pattern. It was about where your’s was in your first post on it. I couldn’t figure what part of the jacket I was working on. This post helps make sense of that (I think :P ). I’m loving the yarn! The sweater looks beautiful! And I liked The Good Shepherd too. Haven’t seen any of the others though. Thanks for adding to the Netflix queue! I noticed that j a r e d has all of these movies in his queue, too. Coincidence? I totally agree about “The Good Shepherd.” About halfway through, DH and I were looking askance at each other and saying, “This is the best spy movie ever? Wow. Let’s watch ‘Casino Royale’ again!” Who gave this movie good reviews? Oh, everyone. Blech. I love how your handspun makes it look so Zimmerman-y. I totally love how your little jacket is looking. Thanks for posting movie recommendations! It is going to be gorgeous. I love your choice of colour and the beautiful handspun yarn. Have fun with this great pattern! That is a great jacket, and great use of handspun yarn! Nice jacket! I really like how the colors in your handspun are turning out. I love the color choices in your bsj – it looks so handsome. And, as for “The Good Shepherd” – towards the end I was hoping so much for a sudden plot turn more along the lines of “Grindhouse” to put all the characters in the movie out of their misery. Ahhhh yes…. another great reason to buy your FSY — I’ve been hearing and seeing comments about this BSJ both on the web and locally. Will. Have. To. Knit.